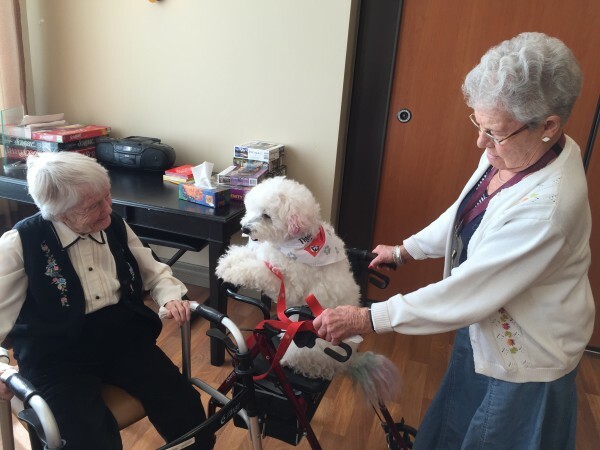 Tiffany Village Retirement Residence Partnership (Tiffany Village and Kenny’s Pond Retirement Residence) proudly participates in St. John Ambulance’s Therapy Dog Program with every month! The St. John Ambulance Therapy Dog Program brings joy and comfort to the sick, lonely and those in need of a friendly visit. The program started in June, 1992 as a pilot program in Peterborough, Ontario and today nearly 3,000 Therapy Dog teams reach thousands annually. If you or your family member would like to more about The St. John Ambulance Therapy Dogs Program, please visit the St. John Ambulance website. The care that my mother has received at Tiffany has been absolutely wonderful. The staff are incredibly attentive, leaving our family completely confident that she is in the best hands possible. There is no end to their attention to detail, and we are thankful for their support. The facilities and activities truly provide a sense of home.